You know how you have some friends who've seen you go through a lot of stuff? They've mopped vom out of your hair after a bit of a session when you were at uni together, or helped you get over awful guys including seeing you cry more than the audience of every screening of every Nicholas Sparks film, ever? 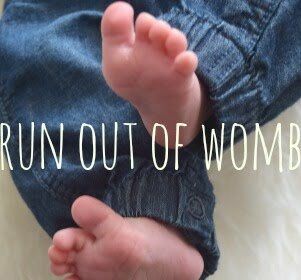 Well, little compares to re-meeting up with the midwife who was there for you when you gave birth.. But my midwife with tiniest man, Cassie, was not only amazingly calm and brilliant at her job, but super nice too. We kept in touch with the occasional baby photo spam, and then I was so excited when she told me she was pregnant (and a bit terrified, obv: can you imagine giving birth after seeing hundreds of other women, er, not exactly beaming through it in the past?!). 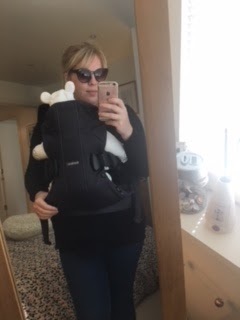 Anyway, to cut a long story short, as a new mum Cassie agreed to review Baby Bjorn's new version of its One carrier, and she came to my house to pick it up, and when I opened the door all I could think about birth and everything she'd seen and I'm pretty sure I turned tomato-red-faced.. 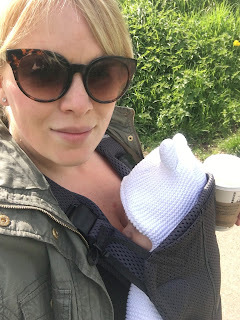 But then I got over it and our babes (and us) are now brunching together and that's a very long way of saying, here's the midwife and new mum's expert review of this popular sling - with the new version able to adapt to fit parents of smaller builds. be, it is now very comfortable and can be worn for a long time. The waist strap is great - it can be tightened to ensure that you're not carrying the baby just on the shoulders, as with other slings which get really painful as the babe gets bigger! 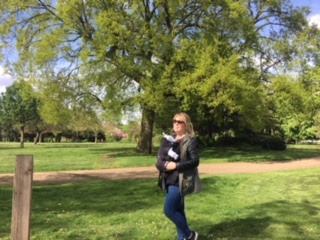 The sling is also easy to put on - it just goes over your head like a jumper and I've found it easy to put the baby in both alone abd with the help of another person, as well as being easy to take the baby out of the sling safely. Other things I like? The carrier is very compact and can be put in a nappy bag or squished under the buggy on the off chance (OK, quite often) that the baby becomes unsettled in the pushchair. Oh, and it’s also safe to put in the washing machine - I'm sure it won't be long before that feature will be needed. I find the material comfortable, plus it's breathable (which will be good in the warmer weather), the straps are wide, supportive and comfy, the buckles are very sturdy and secure, which in turn feels very safe for our little one. Our baby definitely seems to like it as on all occasions he's fallen asleep once we have been moving and appears comfortable with good head support! I found it reassuring to know that the sling was developed with paediatricians to ensure correct support for baby’s head, back and hips, with the International Hip Dysplasia Institute also acknowledging that this sling is safe for the baby’s hips. The one downside of the BabyBjorn that I've found is that I can't breastfeed whilst the baby is in the sling, so it's difficult if out on your own. Friends have said that loosening/lowering the sling makes a feed possible, but that hasn't worked for me. I do like the fact that the One carrier can be used as the baby grows (up to 3 years old apparently! But I'm not sure that I’m that strong!!) and different positions can be adopted once the baby is older i.e. facing outwards or even to carry your toddler on your back. This is such an advantage living in London as you don’t have to rely on taking the pushchair, the sling will be good for using different modes of transport and for going on holiday etc. I definitely recommend the One carrier to other mums and dads."